If you run into Molly Hewitt at Warwick Valley Middle School you may notice that she often carries a small notebook with her. It’s a journal of sorts, a careful record of the sixth-grader’s days. But the entries aren’t the kind you’d find in most dairies. Molly has set a goal, and in her notebook she keeps a record of the progress. “I challenged myself to do 1,000 acts of kindness,” says Molly, who jots down each good deed in her book. Like No. 329, when she complimented her classmate’s shirt, or No. 316, when she fed the dog. She’s doing this because being nice can change someone’s day, “maybe even change their life,” says Molly. 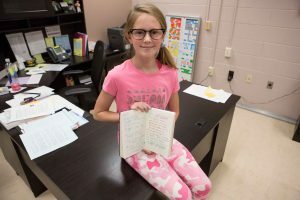 Holly Hewitt, Grade 6, is in the Superintendent’s Spotlight. She has set a goal of 1,000 acts of kindness by Dec. 25. She intends to get to 1,000 by Christmas Day, and was inspired by Ellen DeGeneres, her all-time favorite famous person, who recently challenged her audience to one million “Acts of Good.” Molly loved the idea, then launched her own, kid-sized version of the kindness campaign. Doing good, though, is not new for Molly. She’s a loyal volunteer at Beautiful People, a community sports organization in Warwick that provides adaptive sports for children and young adults with disabilities. She goes every Saturday and is a “buddy” who pairs up with an athlete and helps them play. Baseball is her favorite. Molly says being kind takes a bit of effort sometimes, but the recipient of an act of kindness isn’t the only beneficiary. “Being kind benefits me because it makes my heart warm,” she says. At school, Molly is a quiet force for good, says Warwick Valley Middle School Principal Georgianna Diopoulos. Molly held a bake sale to raise money for the victims of Hurricane Harvey, sold balloon animals to benefit cancer research, and never misses an opportunity to cheer someone up. At least once each day she stops in to the school’s main office for a quick dance party, often bringing a pal or two along with her.